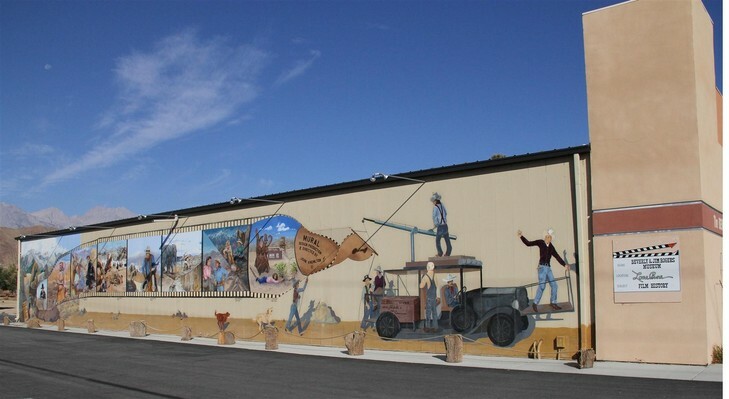 Lone Pine, California is a very special place for the Witney family. My father loved this place, which held many memories for him. 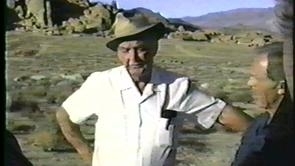 It was by far his favorite location for those old westerns and still is today for other film makers. One is simply awestruck by the beauty of the area, from towering Mount Whitney (no relation) and its neighboring snow covered peaks in the background to the big rock formations of the Alabama Hills below. 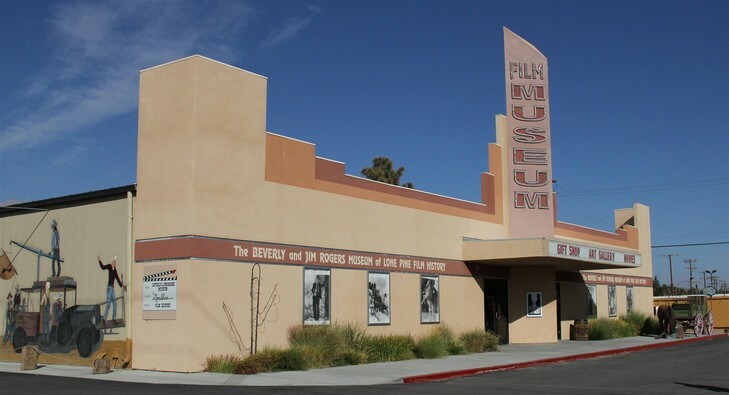 Thankfully the Bureau Of Land Management has preserved the beauty of this area, while the Lone Pine Film Museum in town now preserves its links with the movies and is also the resting place for some of the William Witney memorabilia. The picture on the right was taken on Movie Road just beyond the entrance to Lone Ranger Canyon. That road is exactly the same today as it was in 1938. Click on either the link above or the picture to the left. If look far enough you can faintly see Mt Whitney in the background. You can also see a blowup of this Picture at the new Lone Ranger 75th anniversary display at the Lone Pine Film History Museum 2013. Lone Ranger Canyon, Alabama Hills, Lone Pine, CA. The plaque in the picture reads: “It all began right here! The story of the ambush of the Texas Rangers (which resulted in a single Ranger, a LONE RANGER left alive) was told for the first time here, when director William Witney filmed it for the 1938 serial, “THE LONE RANGER”. The show had been on the radio since 1933, but the ambush story was not created by the radio people. Not until REPUBLIC PICTURES brought the masked man to the movies did this cornerstone of the LONE RANGER come to life." 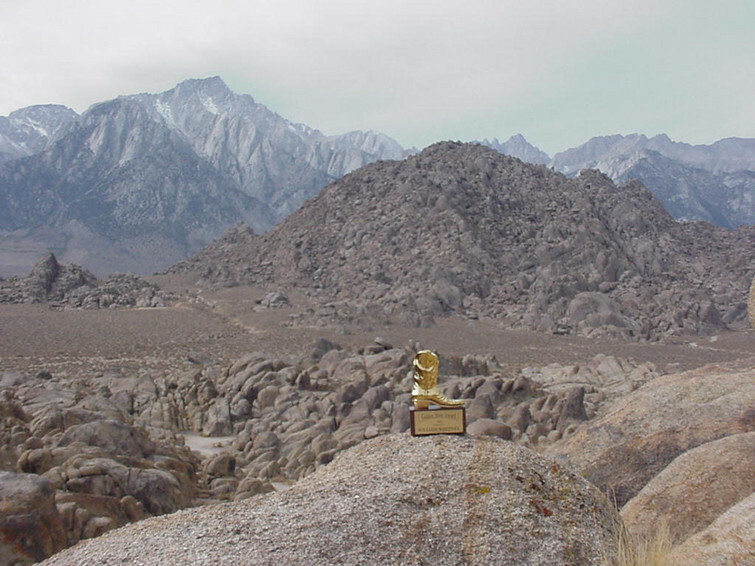 The plaque to the right is just one of many painstakingly put together by Dave Holland, who was known for finding the exact spots where scenes from scores of movies were shot in these Alabama Hills. Each year the hills are filled with these plaques during the Film Festival. The Witney family and Lone Pine Film Festival photographer, Don Kelsen, took these still photos. 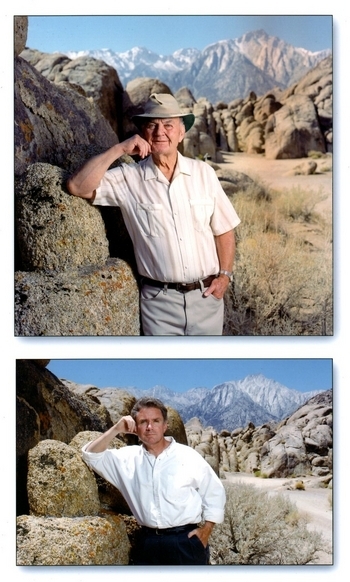 The original one of William Witney (top) was taken for his book cover of “In a Door, Into a Fight, Out a Door, Into a Chase" prior to its release in 1995. 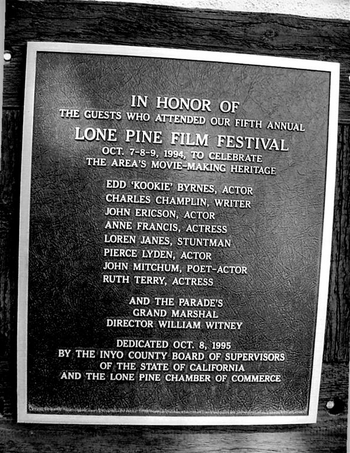 You will find many plaques around the town of Lone Pine from each film festival held there since 1990. 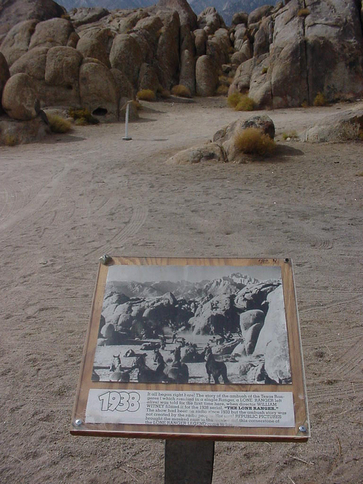 These plaques represent and celebrate Lone Pine's movie making heritage. This plaque is from 1994 when William Witney was a celebrity guest at the festival and the parade's Grand Marshal. 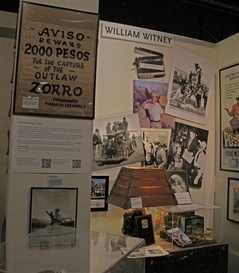 William Witneys display at the Lone Pine CA Film History Museum displays many of his personal items provided by the Witney family. This display was updated June 2013 and will be updated again later in the year. 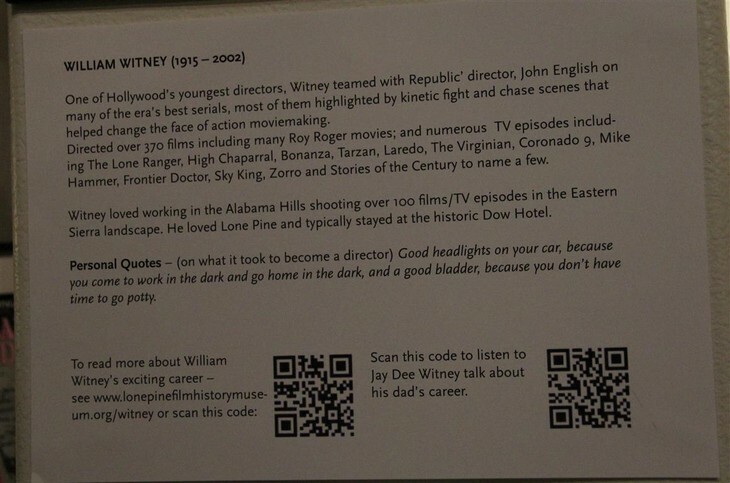 Located in the Lone Pine Film History Museum this posting information provides bar code scans you can take right from this photo. Give it a try! New display June 2013. 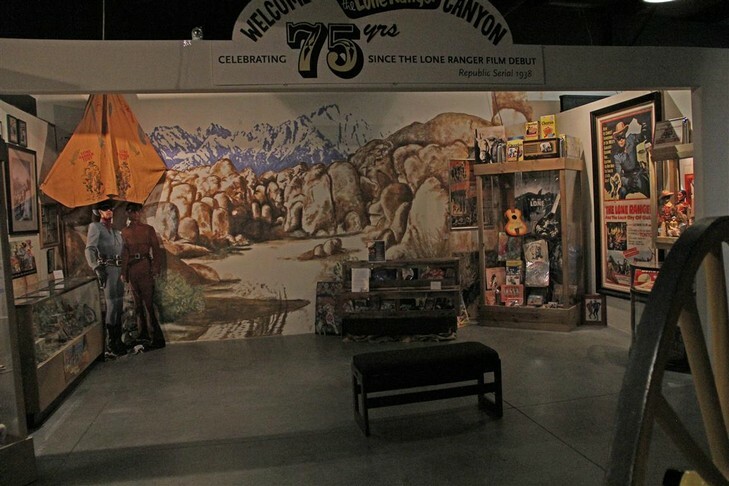 The Lone Pine Film History Museum celebrates the 75th anniversary of 'THE LONE RANGER'. 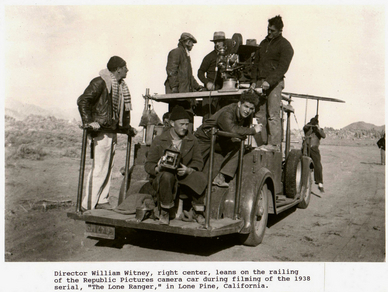 You might even see a picture of William Witney directing that first episode action scene of the Lone Ranger jumping on a bad guy. 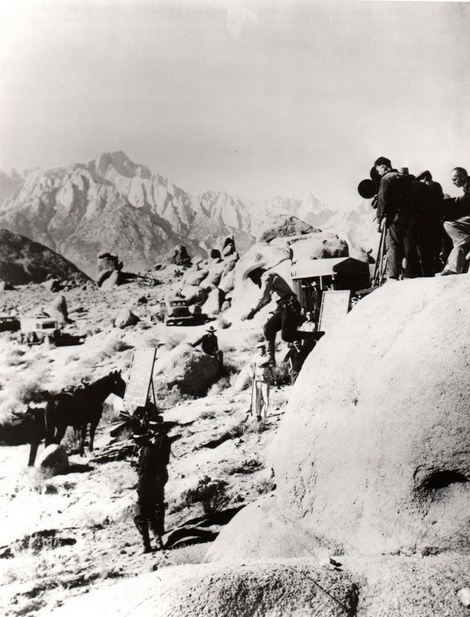 This display, pictures a mural of Lone Ranger Canyon ( Alabama Hills, Lone Pine CA) where that famous shoot out was filmed for the first episode where a Texas Ranger became the Lone Ranger, Directed by William Witney.